We are so excited to launch Feel Better Bling, and appreciate you stopping by the site! Feel Better Bling was created by Beau Dunn after a freak accident in South Africa. Beau has been on crutches since April, and saw what a huge difference there was using Mobilegs ! The accident happened while on her elopement trip, in which her and her husband James had to cancel. They flew back to Los Angeles for Beau to have emergency surgery and a few weeks later celebrated their wedding with their closest friends. While at a dress fitting, Beau realized she needed to bling out her crutches to match her dress, and that is where the idea of Feel Better Bling came from. The response to Beau's blinded out crutches was amazing, and people stopped asking about her knee, and started complimenting her on her crutches! 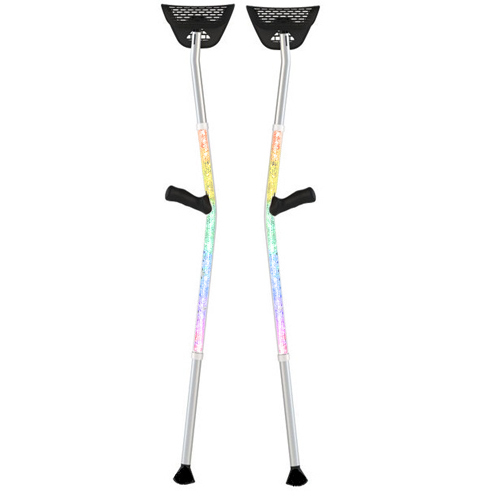 We hope you feel better with your set of Feel Better Bling crutches !